Inter-VLAN Routing on the Nexus 5k. I previously had the chance to play around with the 5596UP switch, and made some notes on how to configure inter-vlan routing. Since this was a 5596UP switch I needed a layer 3 card to take advantage of it. 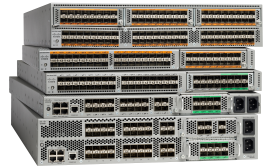 The next-generation units the 5600 include layer 3 without a card required along with introducing 40GB uplinks! However in this post let’s go back to the basics and configure inter-vlan routing on a nexus switch and in this case I am using a 5596UP. In this example I have already configured a FEX port with a 2k check out the my earlier post Connecting FEX (5k to 2k) so let’s start right after that and login into the 5k. Now in configuration mode we have to turn on a feature in the NX-OS to enable VLAN Routing, we do this by issuing the “feature interface-vlan” command. The Nexus runs on efficiency and only loads what it needs or configured. This is familiar approach that Linux uses which loads what is installed and nothing else. In the output below we can see all the features that the NX-OS supports followed by the command to turn on Inter-VLAN Routing. Just like the Catalyst line we are in configuration mode and let’s create two vlans 50 and 60 with IP addresses.
! Create another Interface VLAN! VLANs have been created and IP addresses assigned to the interfaces, now let’s configure the 2k. In this example I’ve configured two access ports on the 2k one is in VLAN 50 and another is in VLAN 60. Starting with VLAN 50 on port 1 on the 2k. interface  when edge port type (portfast) is enabled, can cause temporary bridging loops. You’ll notice the warning when we configure the port as an edge port, in the Catalyst world this is the same as spanning-tree portfast. Let’s next configure port 25 on the same 2k into VLAN 60. Done and Done, If you hook-up two PCs with correct IP address scheme in the separate VLANs you would be able to ping them. To verify the routing table you would do a show ip route, just like the IOS world 🙂 Like always I hope this information is helpful and comment below if you have any questions.